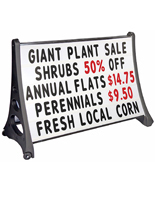 Sidewalk sign: 48" x 36"
This sidewalk sign is a large outdoor sign display. 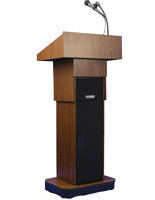 The ample double sided 48" x 36" face gives you plenty of room to get your message out there. The letter board face includes 1.5" diameter frame rails at the top and bottom adding support and embellishing the sign. 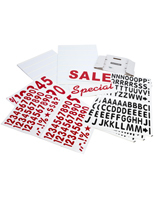 This outdoor changeable letter display, sidewalk sign can be updated as frequently as you need. Simply slide the letters in and out of your sidewalk letter board. Our sidewalk sign, also known as a roadside board, includes a set of (421) 5" letters, numbers and symbols. 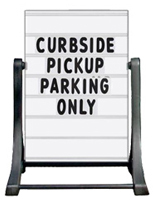 This double sided sign, sidewalk sign will fit through any standard 36" door. The sign legs hold 10 to 15 lbs of sand each for extra stability in winds up to 30 MPH. 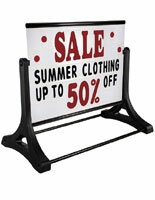 Our big sidewalk sign displays up to 5 lines of 5" letters, numbers or symbols on each side. 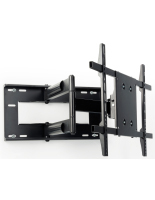 The rustproof technopolymer and internal steel support is very durable and safe to use in light rain. 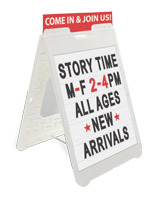 This roadside changeable letter board, sidewalk sign has hand-holds for easy portability. Quick assembly takes less than 3 minutes, requires only a screwdriver. 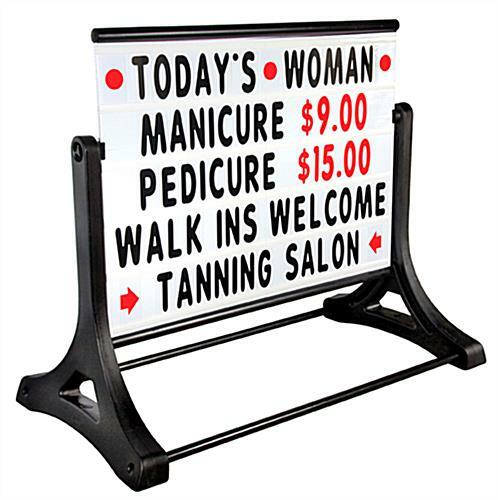 This sidewalk sign is the perfect message displayer for retail shops, salons, convenience stores, libraries and much more. 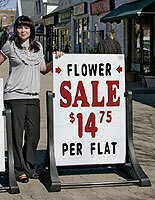 Our sidewalk sign is the ultimate in outdoor displays!